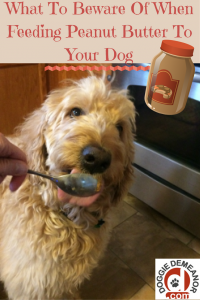 If you are like most dog owners you may have already discovered just how much your dog loves peanut butter. 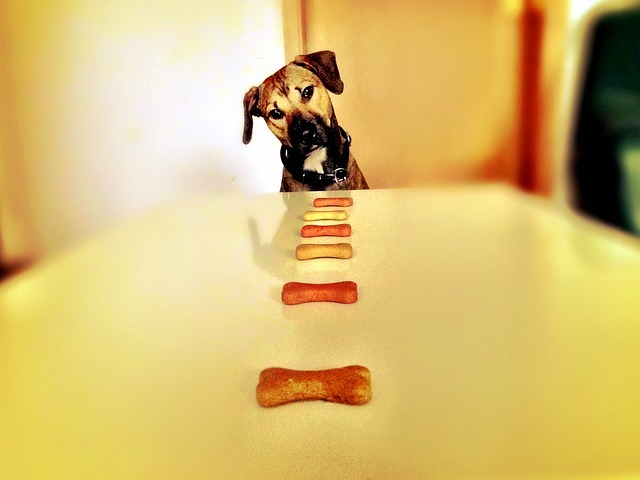 People often use peanut butter as a reward while training their dog, or to mask their dog’s prescription pills. And, commercially sold peanut butter treats are commonplace on the market. But, can dogs eat peanut butter safely, you ask? Well, yes and no…..in moderate amounts, peanut butter is perfectly fine, as long as you choose the right kind. First, I say moderate amounts because it is very high in fat! For this reason you should steer clear of peanut butter if your dog has any liver or pancreatitis conditions. Second, there are certain ingredients found in some peanut butter brands that will not be safe for your pet. So, let’s get down to the details!……….. In a perfect world, all brands of peanut butter would contain just one ingredient…..peanuts. However, as you probably already know, many commercially sold brands add some pretty unhealthy ingredients, so always be sure to read the ingredient listing. Hydrogenated, or partially-hydrogenated oils: If you see an ingredient label with the word “hydrogenated” on it, run for the hills. Hydrogenated oils are, unfortunately, found in way too many edible products, and are extremely bad for both dogs and humans. This is the stuff that clogs arteries and contributes to diabetes, among other things. Not something you would feel good about dishing out to your beloved pooch. 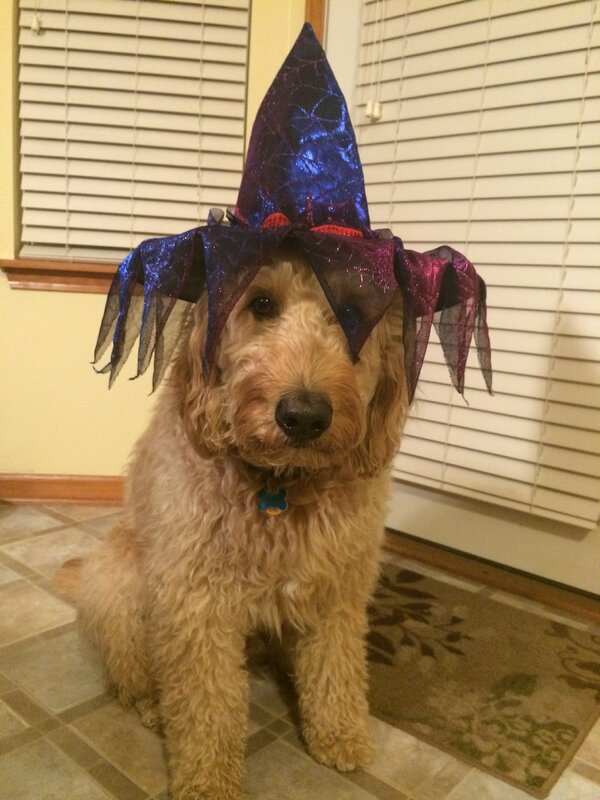 Sugar: Do not buy peanut butter for your dog that contains sugar. Sugar is bad for your dog’s teeth, and can contribute to obesity and diabetes. Basically, the peanut butter you choose should be made up of ground peanuts, and be void of those nasty extra ingredients. Reading the ingredient listing before you buy is a must since product labels can be deceiving! People are often fooled by a label marked, “natural”, but manufacturers can add sweeteners and partially hydrogenated oils and still call it “natural”. Watch for labels that say, “peanut butter spread”. These are not going to qualify as your healthy peanut butter; manufacturers can add many more ingredients in there. Reduced fat peanut butter often contains more salt and sugar to compensate for the lack of flavor, both of which would not be good for your dog. 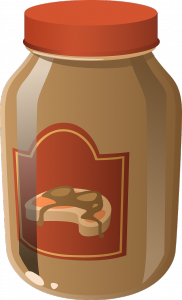 Honey roasted peanut butter often has extra calories and sugar. Xylitol has become an increasingly popular ingredient used to replace sugar. For humans it can be used in medicine to prevent middle ear infections in children, in oral products to prevent tooth decay, and as a replacement sugar for people with diabetes. Some of the foods it is being used in are candy, gum, mints, chocolates, and other sugar-free foods. But, xylitol is extremely toxic to your dog when consumed even in very small amounts, and it is now being found in some brands of peanut butter. This adds to the list of reasons to always read the ingredient listing prior to buying. But, what’s worse, is many people, even if they did read the label, would have no idea that xylitol is even toxic for their dog. So, please help to spread the word! Add peanut butter & milk. Knead dough. Roll out to 1/4″ thick onto floured surface. Bake 20 minutes (or until golden brown) on a lightly greased baking sheet. I don’t own a dog but this is a good information even for ppl in general. I know peanut butter can be replaced with peanuts. But because I was diagnosed with high cholesterol problem I ate a lot of peanuts since I heard they are good for lowering cholesterol. Then I got sick of eating peanuts and nuts, I started eating peanut butter. I know I should be avoiding it if possible but I’m definitely going to check if it’s hydrogenated or not if I cannot resist. Yes, whether dog or human “hydrogenated” on any ingredient label is bad news! My dogs love peanut butter! But I will admit, I’m guilty of probably not giving them the healthiest peanut butter. It’s definitely good to know what to avoid when giving peanut butter to our dogs. I might have to pick up a different brand and try making those peanut butter oatmeal dog treats. They look really good! Thanks so much for this very informative and in-depth article. I agree with you whole-heartedly that we have to be very careful when purchasing peanut butter for our dog. Manufacturers are so sneaky. I just look at the label and if there is anything in there other than peanuts or a little salt for flavor, I just won’t buy it. Lately, I’ve just been making my own peanut butter in the food processor. I just toss a bunch in and voila! At least I know that way my dog isn’t getting any garbage. I love your recipe. It looks so appetizing I want to eat them! I love the idea of making your own peanut butter…by far the safest bet to knowing what goes in it!